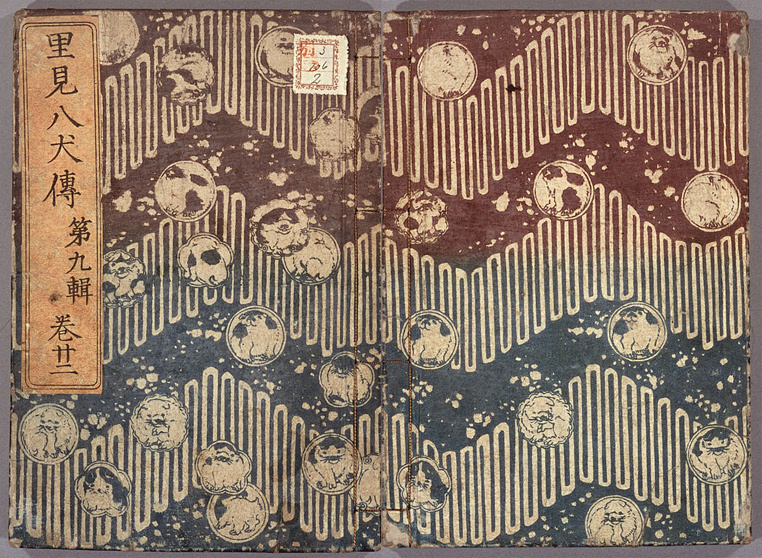 This paper will focus on the production of commercial fiction in Japan during the first half of the nineteenth century by focussing on the process through which Kyokutei Bakin's great novel the Hakkenden was produced and distributed. 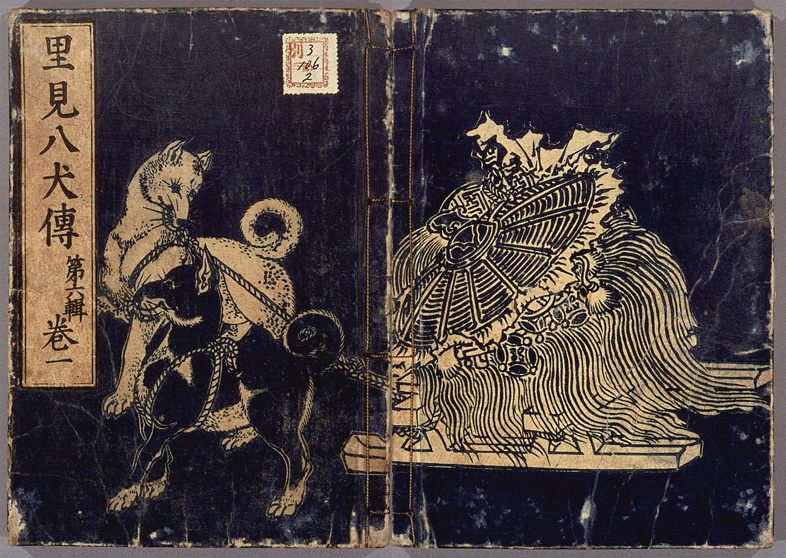 While the Hakkenden was produced as commercial fiction, the books themselves were beautifully produced and came, after their discovery by Western collectors, to be thought of as works of art. The focus of my talk will be the publishing process beginning with the publisher who coordinated the work of the author and illustrator with that of several craftsmen including the copyist, the block carver, and the printer. 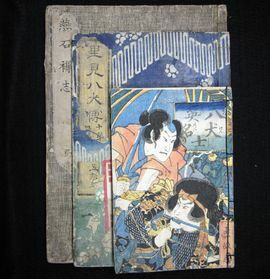 While this process was in many ways shaped by the Chinese model of book production going back to the Song, the bindings, cover designs, and frontispieces used in this fiction were all developed specifically for the commercial book market in Japan and would continue to influence the look and feel of Japanese fiction well into the Meiji period even after moveable type was widely adopted. 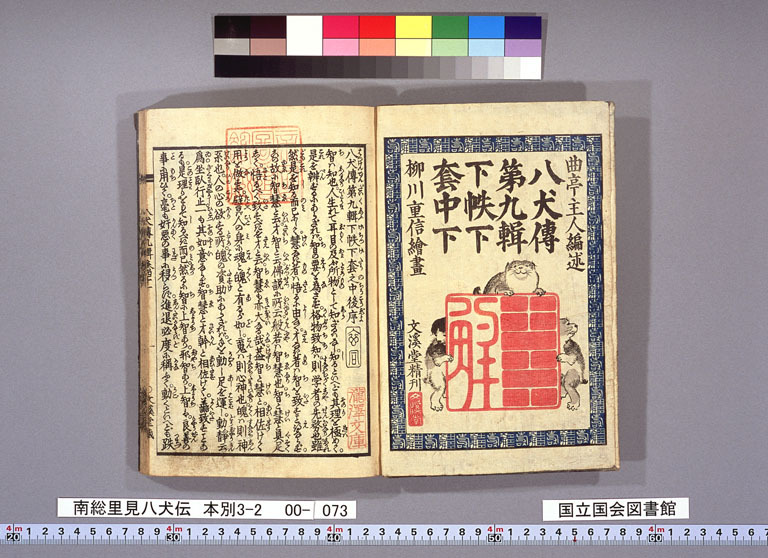 The talk will conclude with a discussion of the production and circulation of various later and pirated editions, digests, pornographic versions of the Hakkenden produced well into the Meiji period as a way to sketch the social history of the book trade across Japan's nineteenth century. Good evening. I am TAKAGI Gen of Chiba University. My spoken English is limited so I have asked Professor Jonathan Zwicker of Michigan University to translate my paper into English and would like to thank him for his help. And I am afraid that my pronunciation may be difficult to understand at times so please feel free to ask questions during the Q&A period. 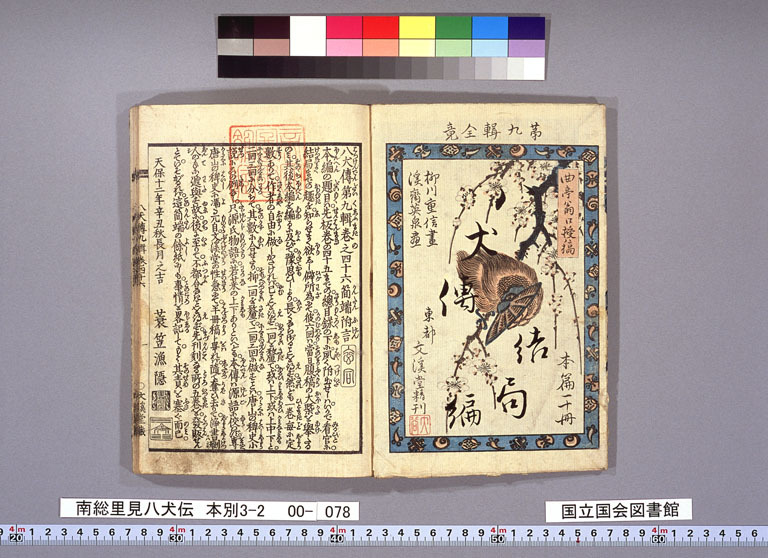 Through my presentation today, I would like to try to problemetize what I see as a somewhat troubling trend within recent studies of Japanese literature - and art - both in Japan and abroad. Within the history of the study of Japanese literature, problems derived from textual studies have been extremely important. And yet it is not the case that we have necessarily, based on such studies, come to a new methodology. Rather it seems as if we have in some ways returned to a somewhat old-fashioned mode of literary criticism and artistic appreciation in the academy at large in which we often naively reify the author or (artist). 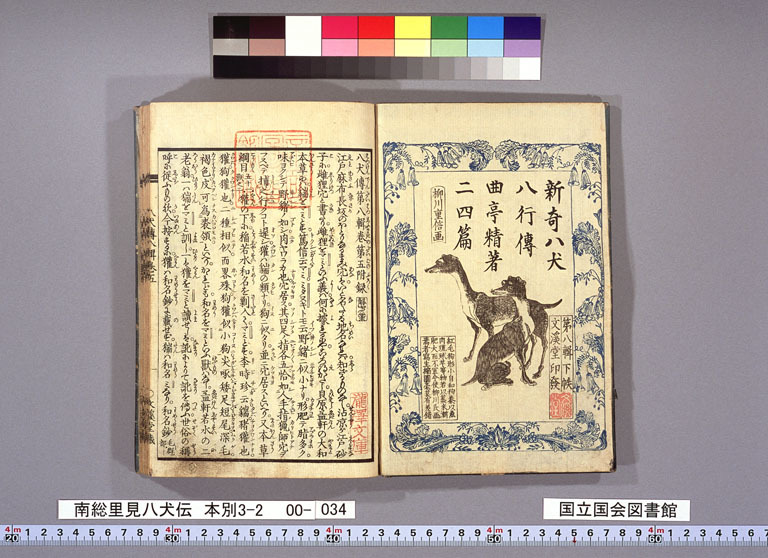 Thus I would like to relativize the place of the author through and examination of historical conditions surrounding the block printed book as a thing - a medium materially embodied - and by giving specific examples. 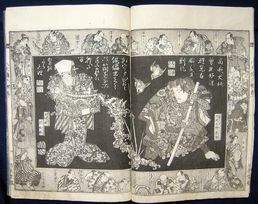 I would like to begin with some examples taken from a genre of illustrated books called “Yomihon” which are representative of the fiction of the Edo period. 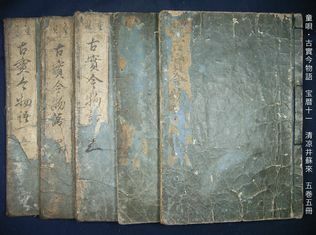 These examples were published in the eighteenth century and have covers that are quite plain containing no patters or images but only bearing a “Daisen” on which the title is printed. These books do include illustrations but they are simple designs printed in black and white. 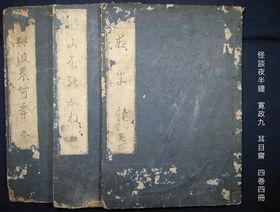 Next I would like to introduce a copy of a first printing of the first edition of Kyokutei Bakin's great work the Nansou Satomi Hakkenden which was published between 1814 and 1842. You will see that once we reach the nineteenth century, yomihon come to be decorated in quite beautiful ways. This is because yomihon have come by this time to hold a mass commercial value through the role of commercial lending libraries. Please take a look at the design of the covers which are quite artistic. 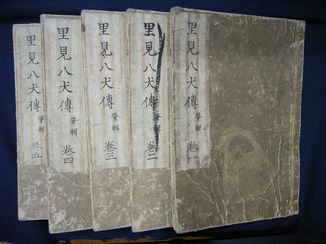 First installment of five volumes (usually, five volumes were published every year). 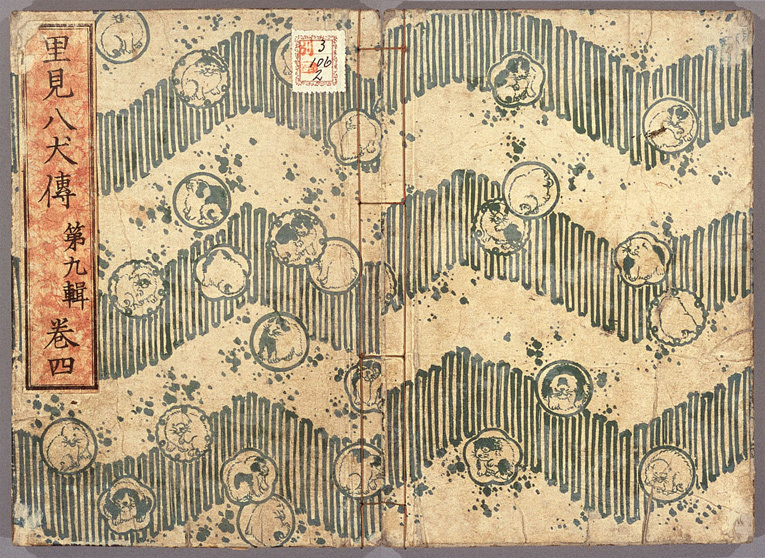 The Mikaeshi or title page of the first volume and the kanbun preface. 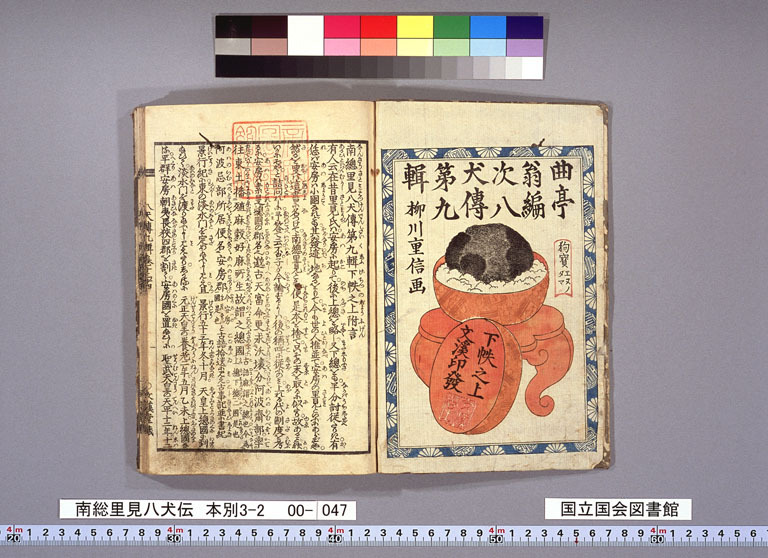 Here you can see a seal that reads “Takizawa” marking this as Bakin's own copy. It's held at the National Diet Library in Tokyo. A title page and preface from a volume of the second installment. 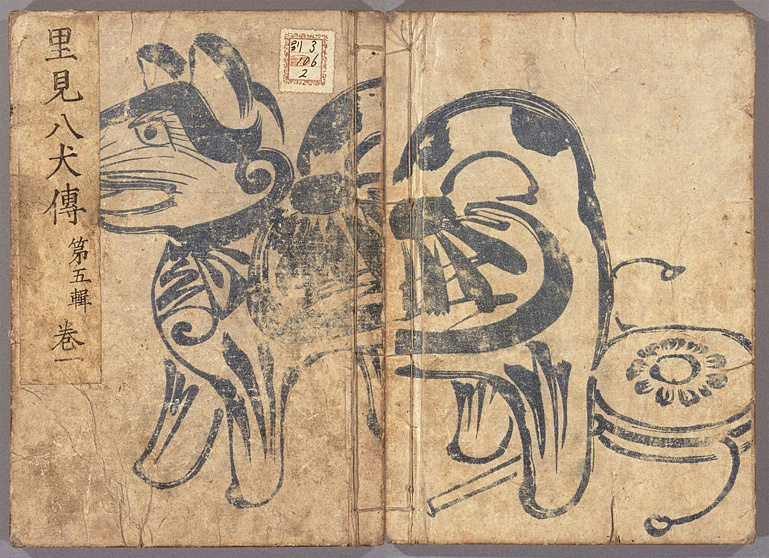 The title page is written in a script resembling a seal or hanko and on the title page you can see Bakins own marginal notes above the text. 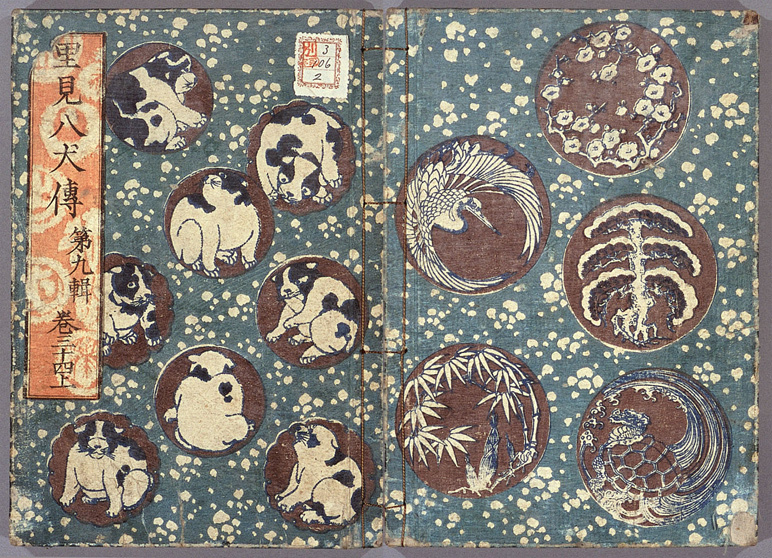 Cover of a volume from the third installment with a design of puppies and snowflakes. A title page and preface from a volume of the third installment. Cover from a volume of the fourth installment. 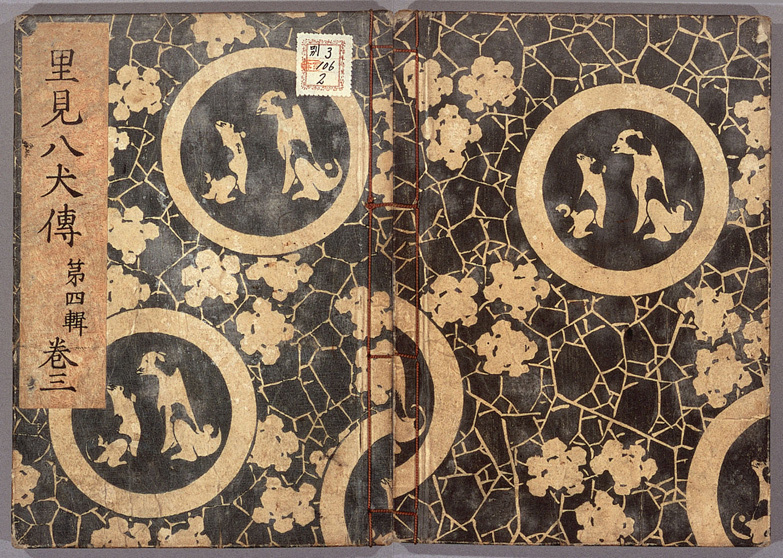 The two dogs on the background of a pattern know as Baika Hyouretsu form the character for eight. A title page and preface from a volume of the fourth installment. The cover from a volume of the fifth installment. The cover shows two toys, and Inu Hariko and a DenDen Taiko. A title page and preface from a volume of the fifth installment. The title page shows a messenger pigeon and a messager dog. 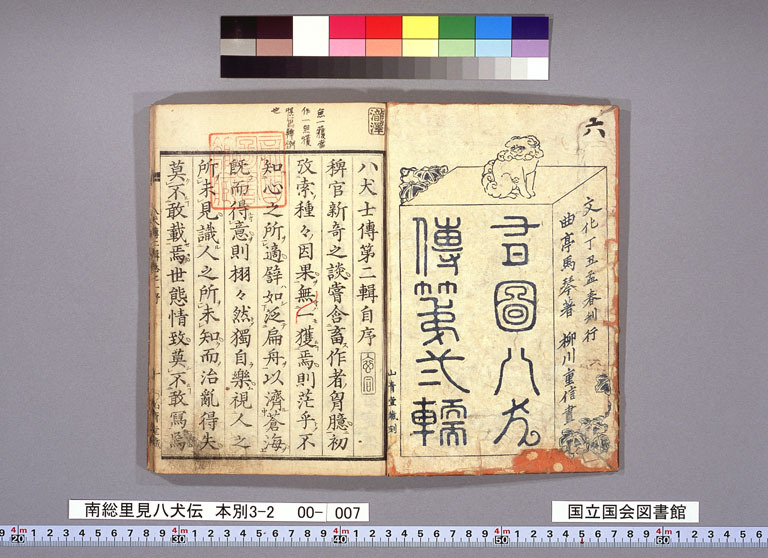 Cover of a volume from the sixth installment. 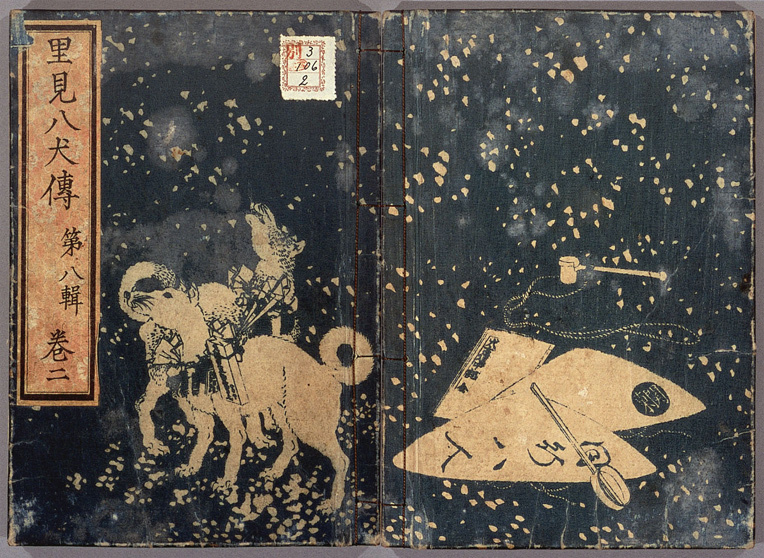 The title page shows a Takarazukushi in a dogsled. A title page and preface from a volume of the sixth installment. 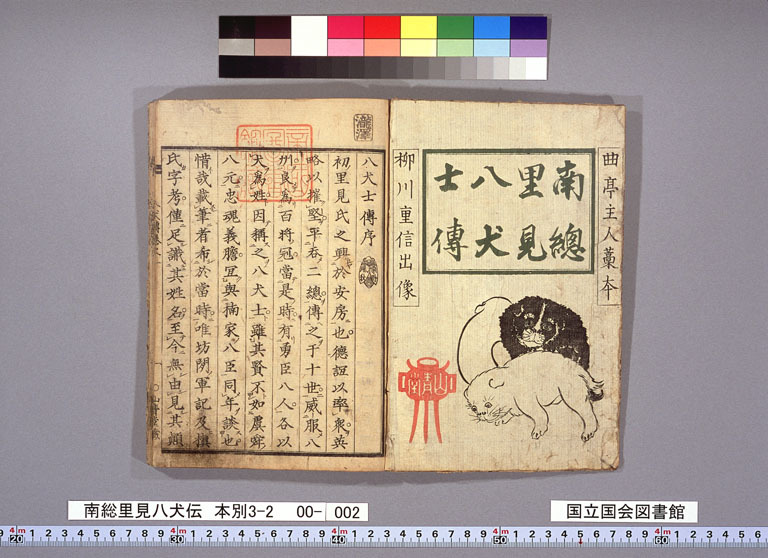 This volume was part of Bakin's personal library and bears a seal reading “Takizawa bunko”. 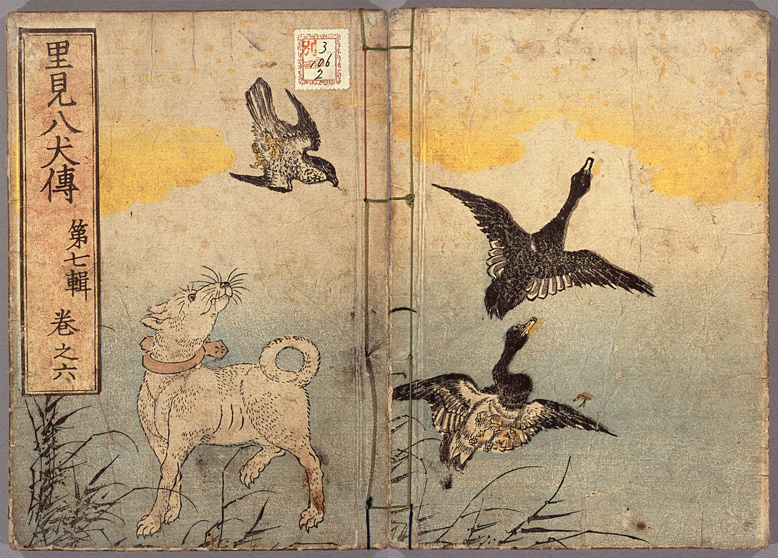 The cover of a volume from the seventh installment bearing images of a wild goose, a dog, and a pigeon - animals used as mesengers. A title page and preface from a volume of the first part of the seventh installment (the seventh installment came out in two parts). A title page and preface from a volume of the second part of the seventh installment. 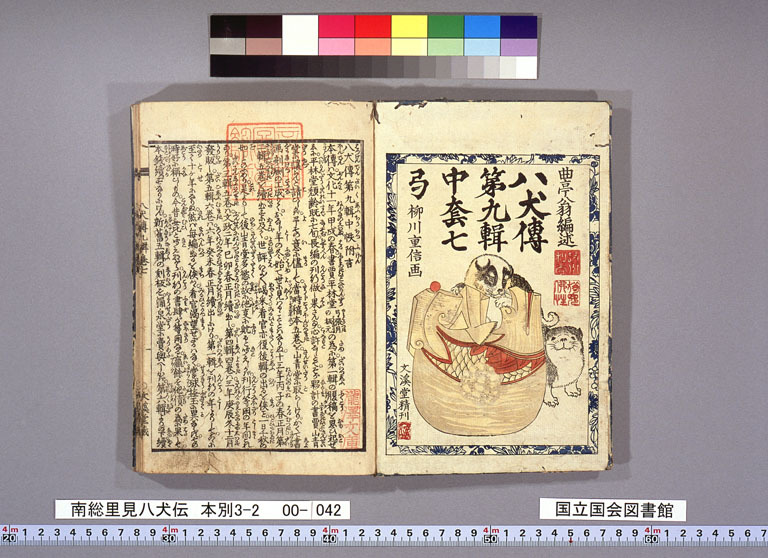 Cover from the eighth installment (a dog on the Ise pilgimage with a fuda attached around its neck). A title page and preface from a volume of the first part of the eighth installment (the eighth installment also came out in two parts). A title page and preface from a volume of the second part of the eighth installment. 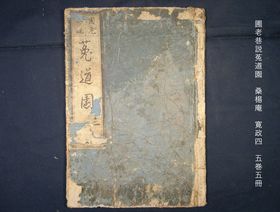 The cover of a volume from the ninth installment - in order to end in nine installments, the ninth installment went on and on and actually accounts for about half of the total Hakkenden. 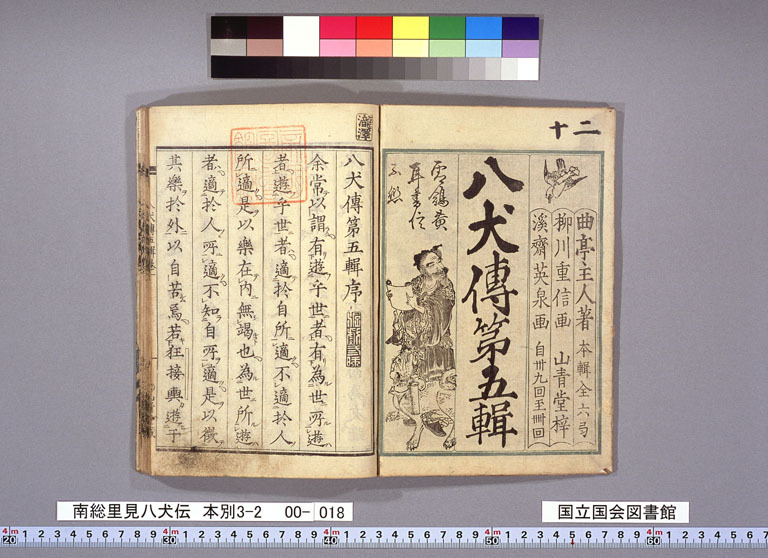 The cover, title page, and preface from a volume of the ninth installment. Below you can see that the same pattern with different colors continues. The following are also of the same pattern but with different colors. 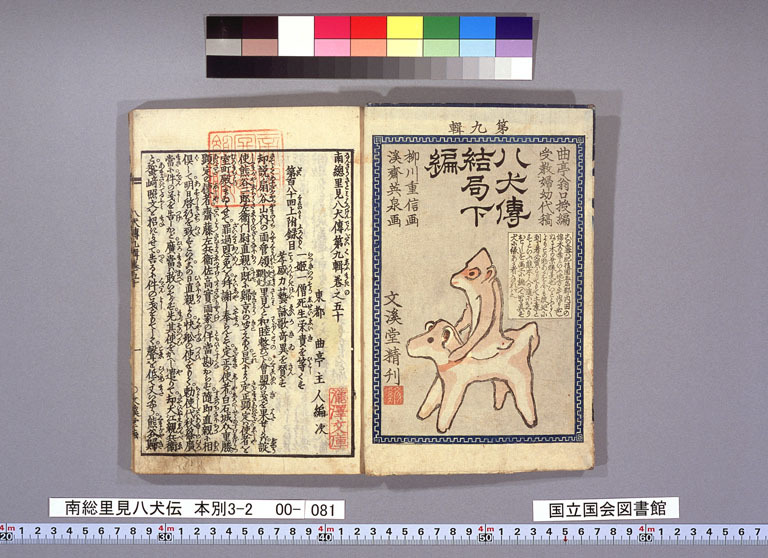 On the Mikaeshi is the figure of Kaisei riding a dog. You often see of Kaisei at the opening of books. 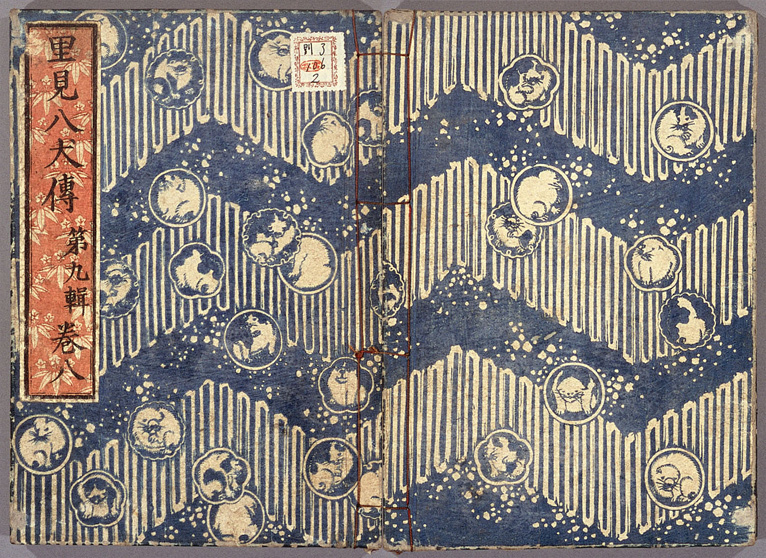 Cover bearing images of a crane, a turtle, and a shimadai all symbols of celebration marking that the end of the book is approaching. 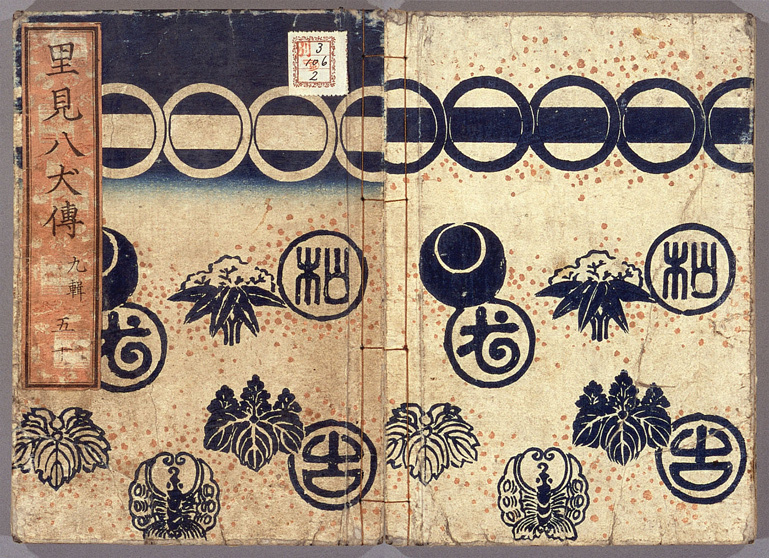 A takarazukushi similarly pointing to the end being near. The title page which bears the words “dictated by Kyokutei okina” poiting to this portion have been dictated due to Bakin's failing eyesight. 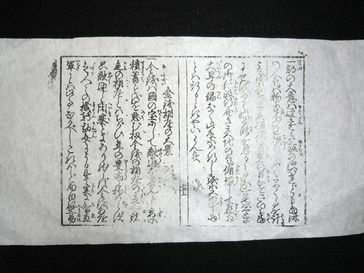 Title page which bears the words “dictated by Kyokutei okina and transcribed by the wife of his son” pointing to this being transcribed by Bakin's daughter in law O'Michi. 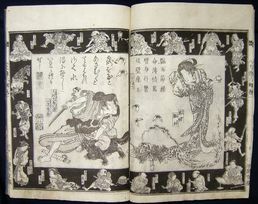 The frontispiece to a volume from the sixth installment printed with an overlaying of thin grayish ink and a thick lustrous ink know as tsuyazumi. 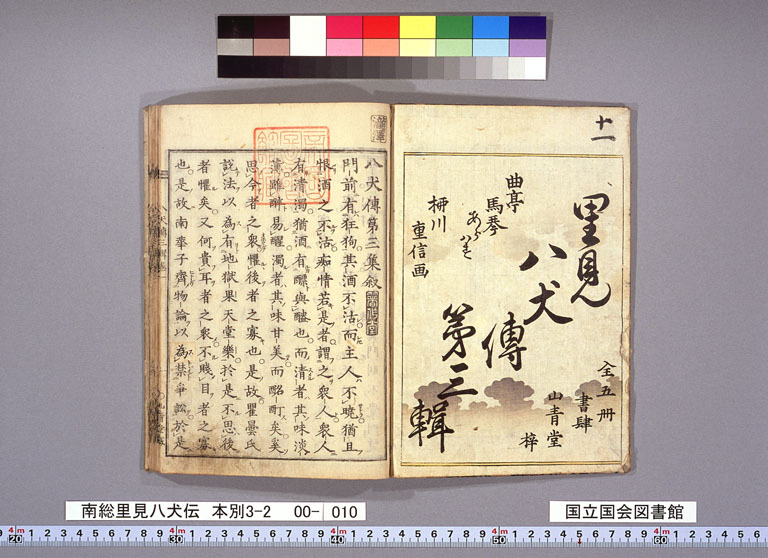 What I have shown here are examples taken from the 106 volumes of the Hakkenden published over 28 years during the first half of the 19th century. 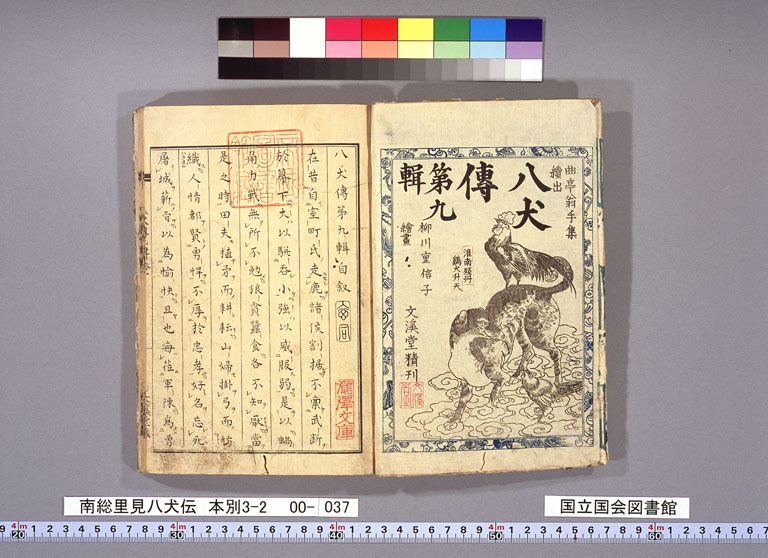 As you can see from the final examples, the book contained color illustrations and frontispieces produced using the multistep printing technique many of you are familiar with from the history of ukuyo prints in order to produce an aesthetic which invited the reader to pick up the book and begin reading. 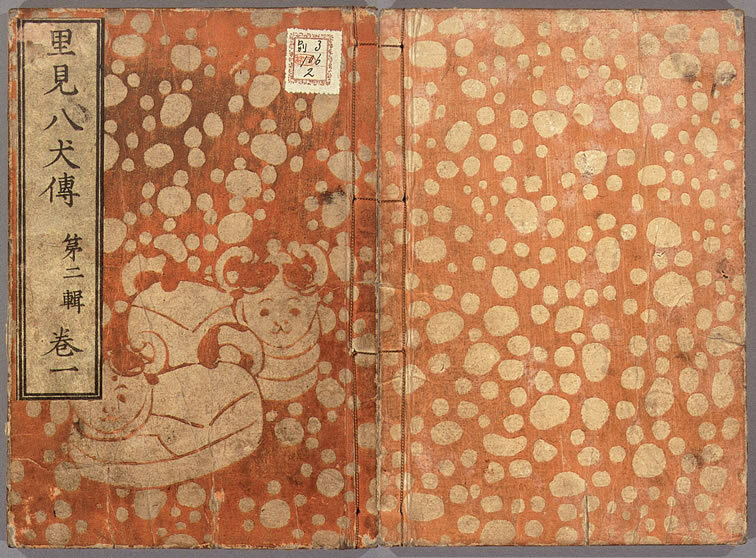 I do not have time to go into much detail today but one of the defining characteristics of the block printed book in early modern Japan was that most included illustrations. The Honolulu Academy of Arts itself is home to many woodblock prints and illustrated books, you know. 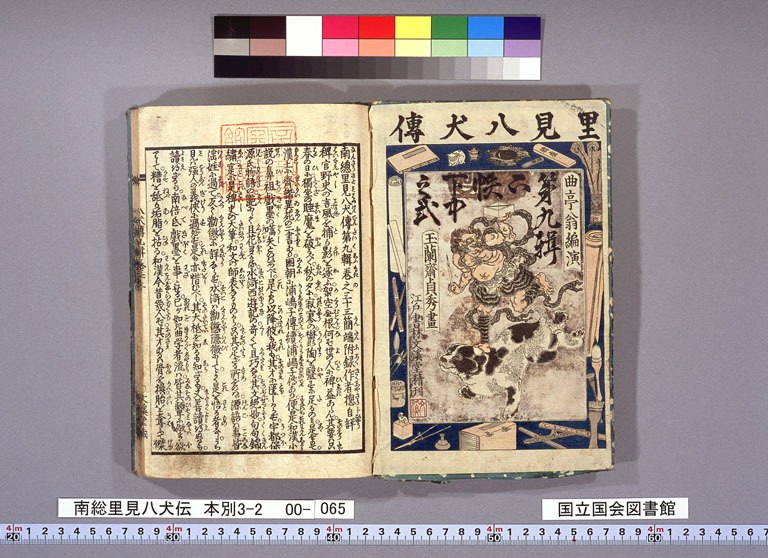 It's even possible to imagine that this close connection between word and image in Japanese book culture has some kind of deep connection with the culture of modern Manga. Now I would like to introduce an image from an illustrated work of fiction which depicts the state of publishing in the nineteenth century. 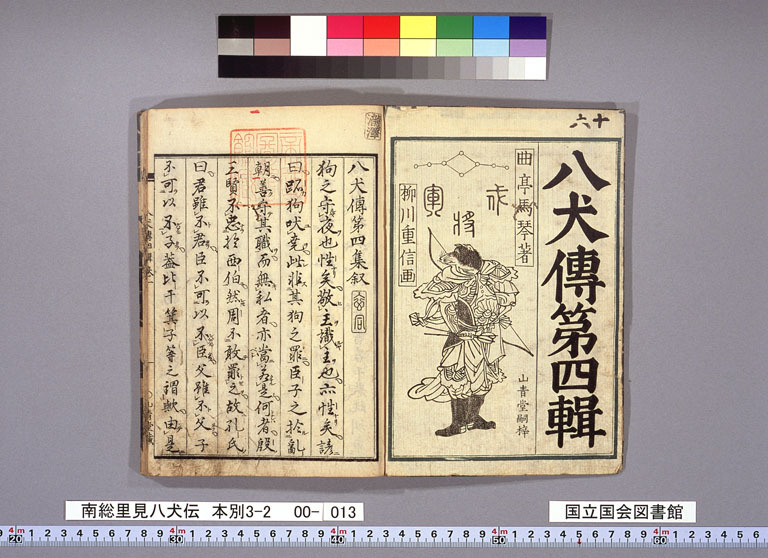 It is taken from a work entitled Takarabune Kogane Hashira published in 1818 by Touri Sanjin. 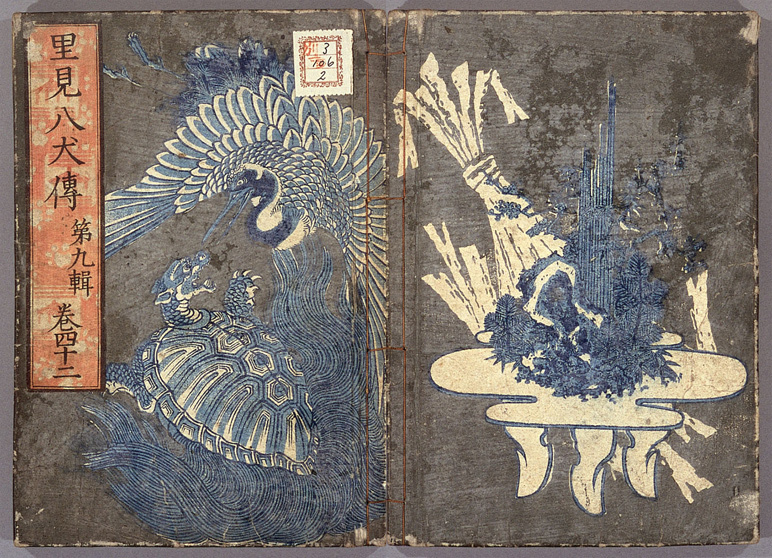 The page I've given here does not have much to do with the plot of the book but it is quite interesting because it depicts the process of putting together a block printed book in the 19th century. 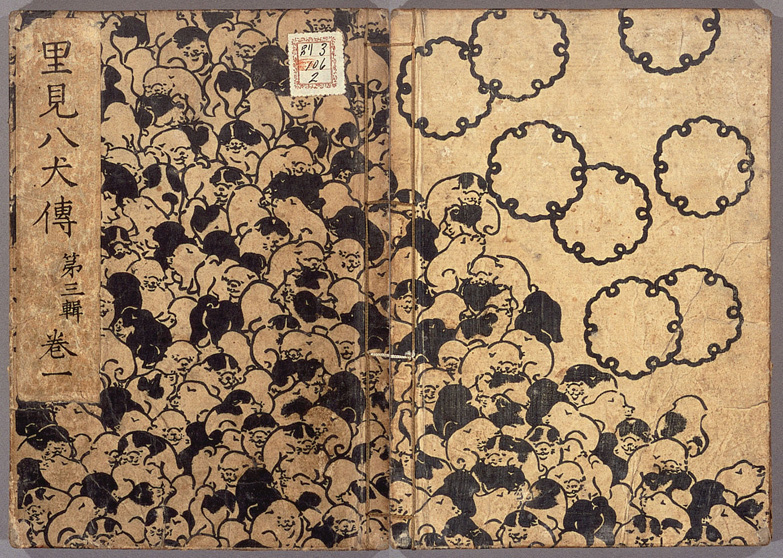 The figure in the center - whose face is covered over with a coin - is the publisher, Izumi Ichibee. He's putting pressure on the various workers in the illustration to hurry up to so he can publish in time for the new year. On the right hand side is the figure of the author, Touri Sanjin thining up the work. On the paper in front of him he is writing the text and sketching the illustrations which he will then pass on to the copyist and the illustrator. On the left is the illustrator, the ukiyoe print designer Katsukawa Shunsen. 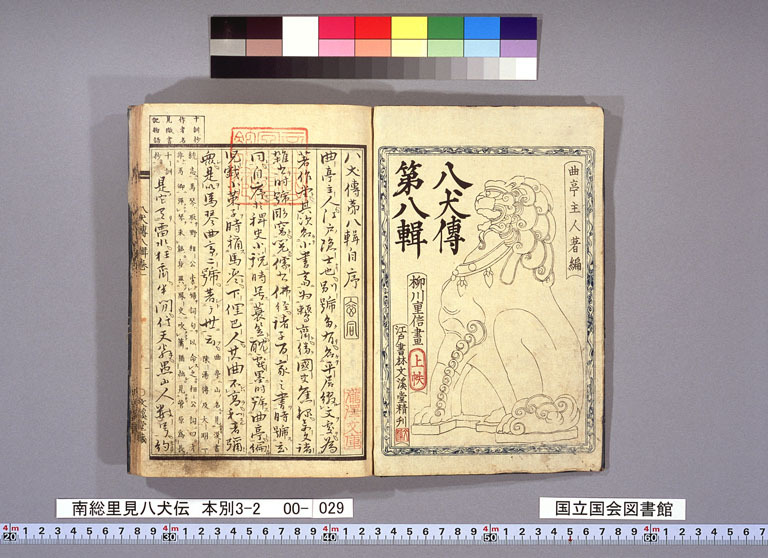 He is producing illustrations based on the author's sketches on very thin Japanese paper that will then be used as the basis for the carved blocks. For ukiyoe print designers, drawing illustrations for printed books was a form of work and a source of income just like creating designs for ukiyo-e.
One point worth noticing is that everything from the overall composition down to details such as various objects in the illustration are all based on the author's rough sketch and everything is drawn according to the author's instructions. During the early modern period there are virtually no instances of an illustrator making images for a work of fiction of his own accord. On the bottom right is the copyist. He writes out the author's text in the blank spaces left by the illustrator while taking account of layout. On the lower left is the carver. 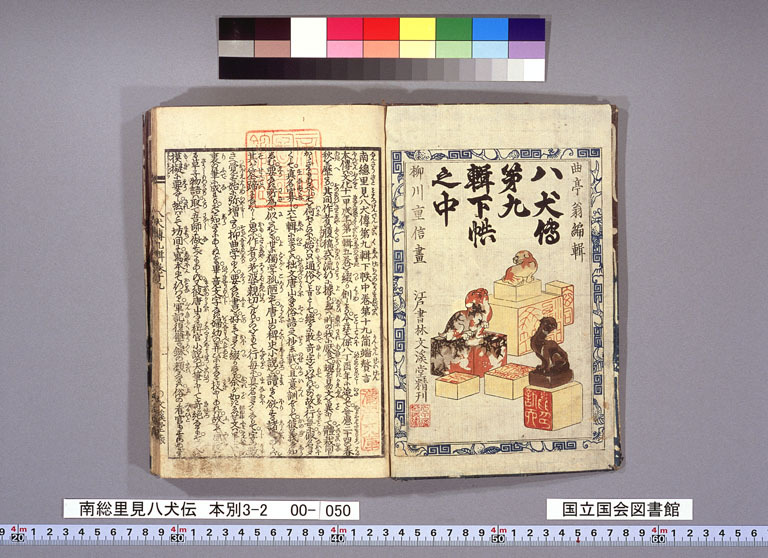 He pastes onto the block the manuscript he has received containing the text of the copyist and the images - with text and image facing downwards - and then carves out those parts of the block which will not be printed, leaving elevated the surfaces of the text and illustrations. It functions just like a stamp. This is extremely detailed work and so it is done by a journeyman who has spent a longtime mastering the skills. In many illustrations that depict block carvers, the carver is wearing glasses and one suspects that the demanding work caused many carvers to have failing eyesight. At the center bottom is the printer. 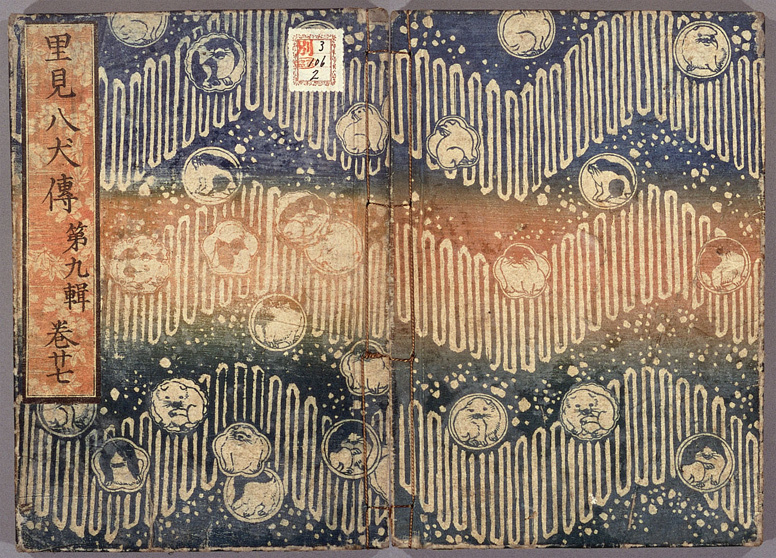 He inks the printing block and then prints the pages through laying it on paper and then rubbing it with a tool called a baren. It is work that required a great deal of strength in the arms and you can see in the illustration he is depicted with quite muscular arms. 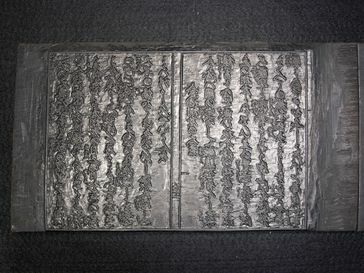 Also in order to make it easier for the printer who worked sitting on tatami, he worked on a printing board which was slightly elevated at the front to make it easier to push down on. To the right and left of him you can see already printed pages stacked up. 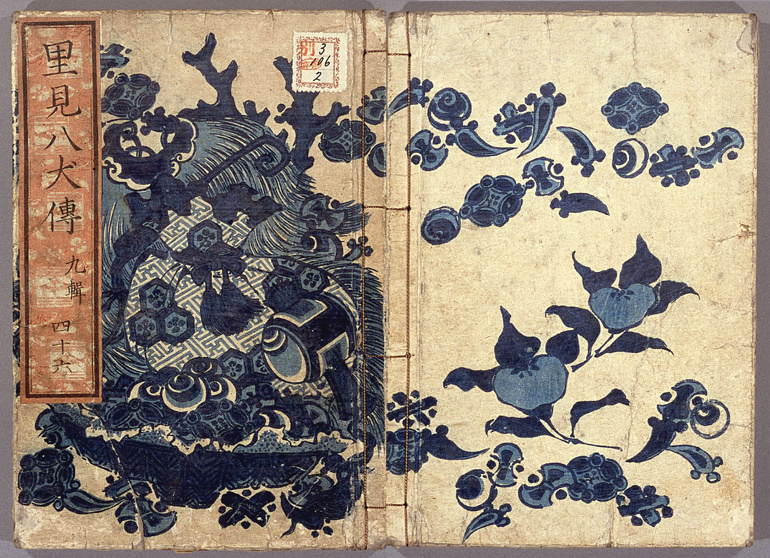 I think we can get a good idea from this of what the manufacture of a block printed book looked like. 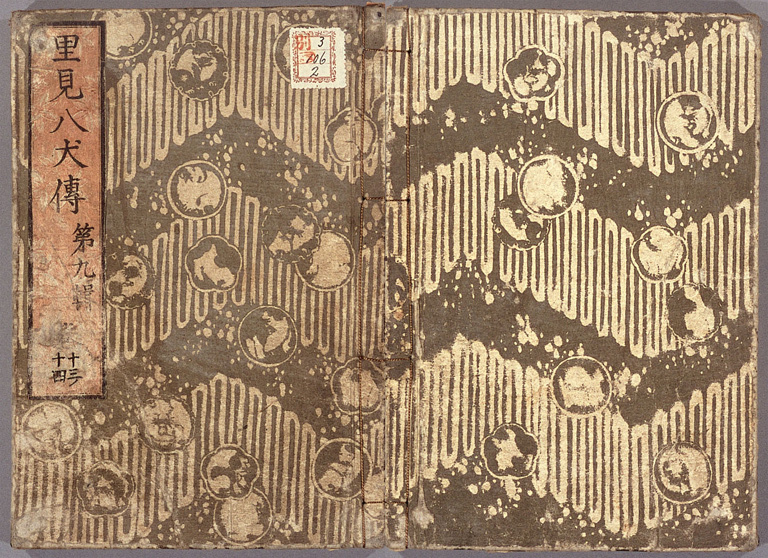 From here, the printed pages would be folded in half and arranged in order and a cover would be attached with thread. 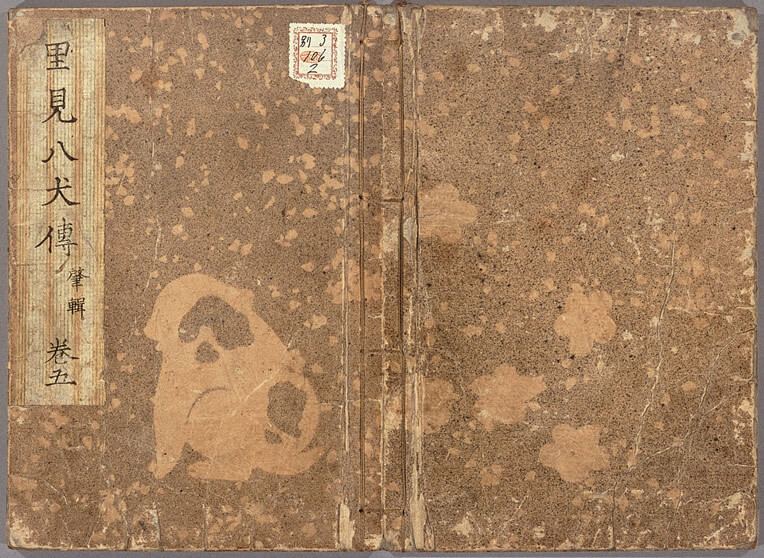 This can be see in an 1802 work by Jippensha Ikku , Atariyashita Jihon Toiya, which portrays the behind the scenes of the publishing world. 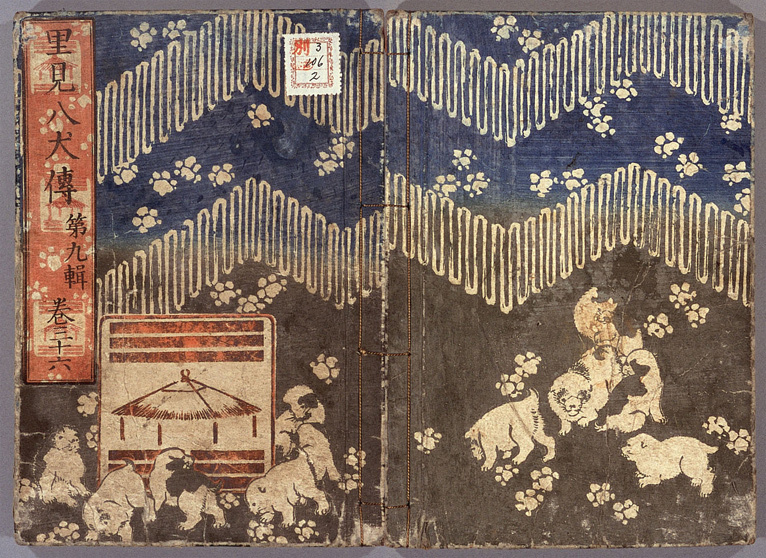 On the left, a youth is using a triangle shaped tool to fold the pages in half. On the right an man is putting the pages in order. 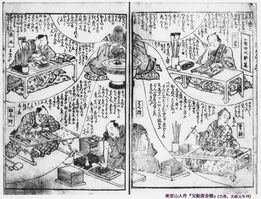 On the left here you can see a group of women using needles and thread to create a binding style known as Yotsumetoji. 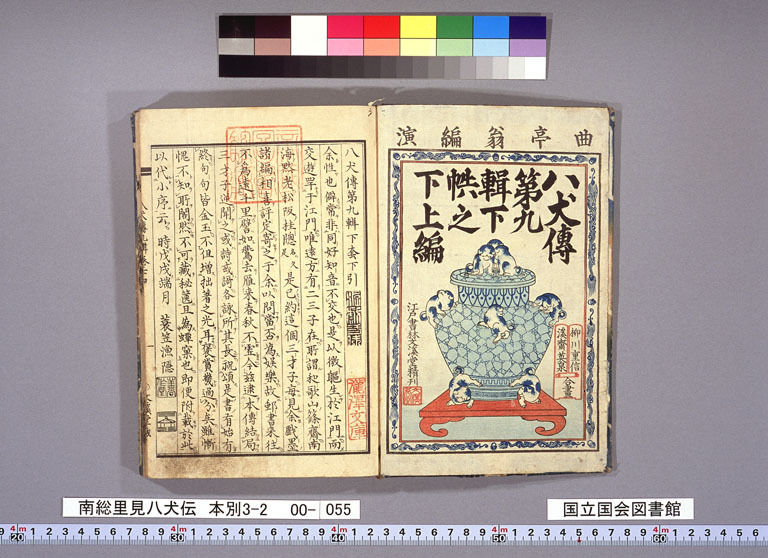 A completed book. 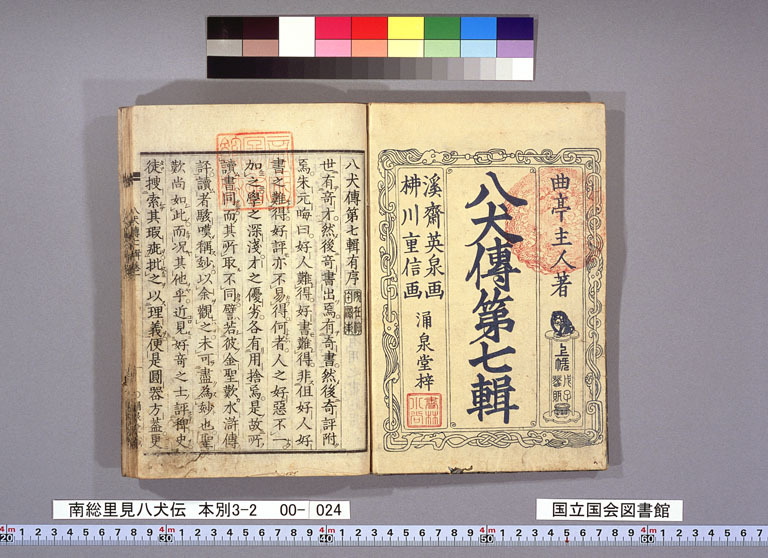 The size of the book was dictated by its contents with serious books published in large oohon format, normal books published in mid hanshibon format and popular works of fiction published in somewhat smaller chuubon format. 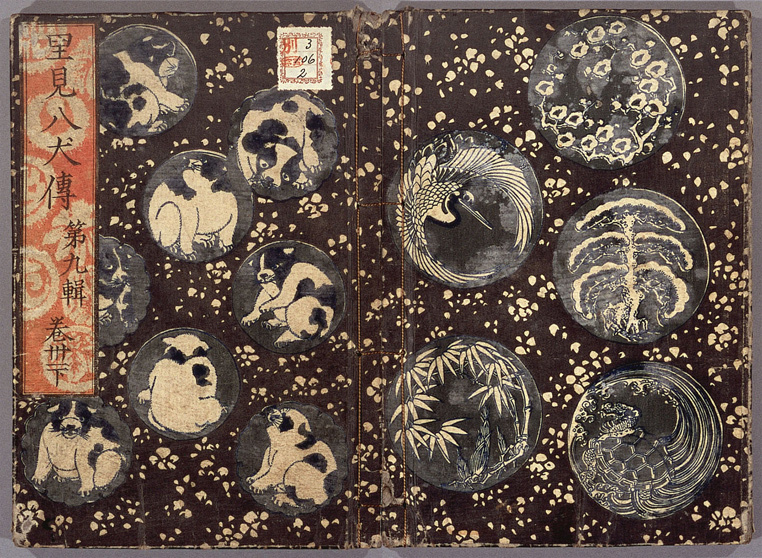 The Hakkenden which I mentioned earlier was a hanshibon; illustrated fiction known as kusazoushi were chuubon. 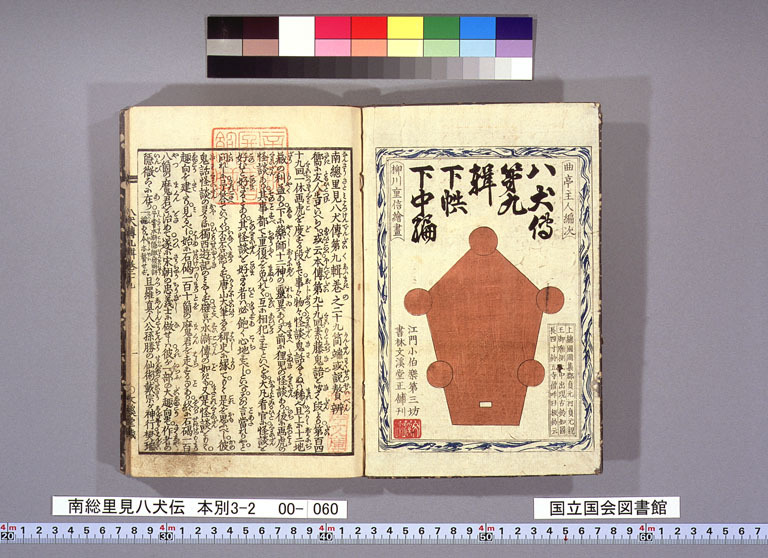 Regardless of the size of the format, Japanese books were generally bound by making four apertures. 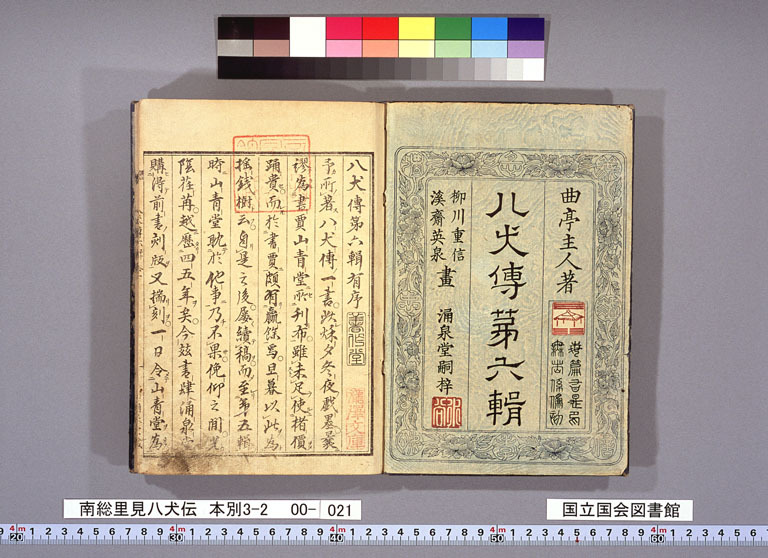 As a rule, Japanese books are written vertically, one reads from right to left. Next please take a look at an example of a printing block which I happen to have. Here is an example of an attempt I made to print off it. It is pretty difficult to make a good print off one of these blocks. As we have seen so far, the publisher was a kind of producer who mobilized a great number of workmen and family members to produce a book. And I believe we can think of both author and illustrator as themselves workmen who were responsible for one part of this process. 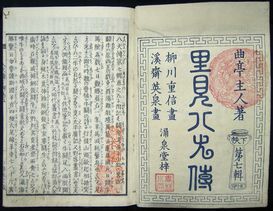 To publish a book advance capital was necessary and one did not know if the book would be profitable until it was sold. In other words, publishing is a very risky business. And the one who bore that risk was not the author or illustrator but the publisher. This is not really any different today. In other words, the there has never been a period in history where the author or illustrator was able to do his or her work just as they pleased and have it published. Or to put it a different way, we should perhaps imagine that within the publishing world it is by precisely means of the publisher's role as producer that the author was able to display his or her genius. I am not, of course, denying the problem of genius or originality of the author but think that we need to recognize that the initiative for publishing lay with the publisher. 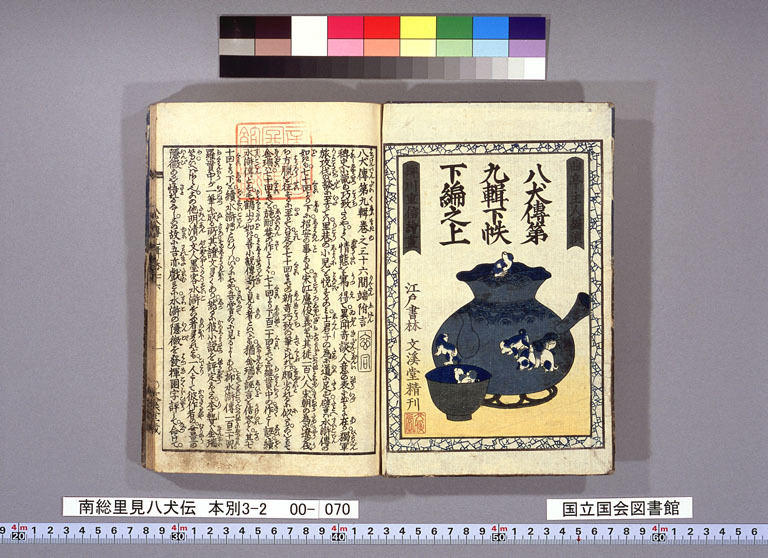 I am afraid I have covered a lot of ground rather quickly but I hope you have learned something of the state of publishing in nineteenth-century Japan. If you have any questions please do not hesitate to ask. Thank you for your patience.